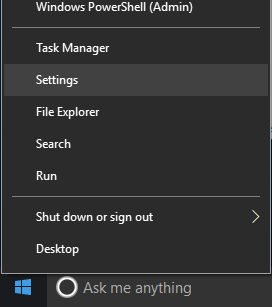 In the Win+X / Quick Access / Quick Link / Power User menu, there is shortcut to open Control Panel and other common management and configuration tools quickly in Windows 10. Control Panel is traditional classic one-stop place for configuring Windows settings, and it’s falling out of love with Microsoft, who determines to focus on and make its modern UWP equivalent Settings the core configuration panel in Windows 10. Meanwhile, Control Panel co-exists with Settings, as the merging of both functionality has not completed. Some legacy functionality from Windows XP era which exists in Control Panel hasn’t been migrated to Settings, while newer configuration options in Settings are no longer added to Control Panel. In WinX menu, the default shortcut is Control Panel, until Windows 10 Creators Update (Version 1703) or more specifically Windows 10 Build 14942 for Windows Insiders who installed preview builds, where the shortcut in WinX menu is switched to Settings. If you wish to change back from Settings to Control Panel, or change from Control Panel Panel to Settings on the WinX Quick Link menu, or even to have both Control Panel and Settings together side-by-side, follow the tutorial below which guides you on how to perform the switch between Control Panel and Settings. Download the desired shortcut for WinX menu that you want to show, namely Control Panel or Settings. Extract the content of the compressed ZIP file, and you should have a shortcut file named 4 – Control Panel.lnk from the archive. Make a backup copy of existing 4 – Control Panel.lnk inside the “Group2” folder. Copy and paste the 4 – Control Panel.lnk shortcut file from the downloaded archive into the “Group2” folder, and replace the existing file, if applicable. Restart the Explorer to make the change effective. If you want Control Panel to show together with Settings, you can just rename to shortcut’s name, for example, to just “Control Panel.lnk”. In addition, it’s also possible to place Control Panel and/or Settings separately in Group1, Group2 and Group3, or they can be moved to another Group to show together. In WinX Power User menu, all shortcuts are separated into 3 groups, divided by separator between them. The lowest grouping is Group1, middle grouping is Group2 while the top grouping is Group3. The number in front of the shortcut indicates its position within the group, counting from bottom to top. However, that number is not hidden for user created shortcuts.